There are many places in the world which have been declared as the haunted places due to the belief of ghosts or other supernatural power. One such place is Bhangarh, which is located in the Alwar district of Rajasthan in India, and has risen to popularity as people believe that the historical ruins present there are because of some supernatural powers meant to harm human existence. However, there was once upon a time a wonderful kingdom with stood to show the might of the kings and the place was indeed very beautiful, also the historical ruins present there are worth a visit but obviously to be on a safer side it is advised to visit the place only during the daylight hours. The place resembles any simple haunted scene depicted in a regular Bollywood flick. Ruins, rocks, rumbles, banyan trees and endless temples share the landscape. Apart from this, there is a chhatri (dome like shape in Indian architecture) which forms a centre of attraction. Some temples that this place is famous for are the temples of Gopinath, Shiva, Mangla Devi and Keshava Rai; however, there are certain places such as a few shops on the main roads, havelis, a palace and a mosque which stand tall in the place surrounded by historical ruins. With so much of spectaculation there are also lot of stories, legends, etc. some locals have also spread some stories that are said to be descended from ages and they somewhat give a vague or you can say somewhat reliable explanation as to what must have led to the destruction of a place which once was a kingdom. One story says that Guru Balu Nath, a saint, had sanctioned the king to build a new town however he had warned the people and the kings that if the new towns shadow touches him, then the entire town would lie in ruins. Also there is a Samadhi in between the ruins where they say that Balu Nath was cremated. The other myth says that the charm of Princess Ratnavati, led to the destruction of the empire. Since the time she turned eighteen she started receiving marriage proposals and there was a tantrik that was head over heels for her and wanted to marry her at any cost. Once when the princess’s maid was out in the market buying scented oil for the princess, the tantrik, with his black magical powers and devised a plan wherein the princess would come to him at the moment she touched the scented oil. However she came to know about this and hence threw the oil towards a rock which incidentally went rolling to the tantrik crushing him to death. On his death bed he cursed the kingdom and also the person who lived in it, which is the reason believed behind the destruction of the entire place. However the haunted place still remains a big piece of mystery for those who do not believe in these legends. 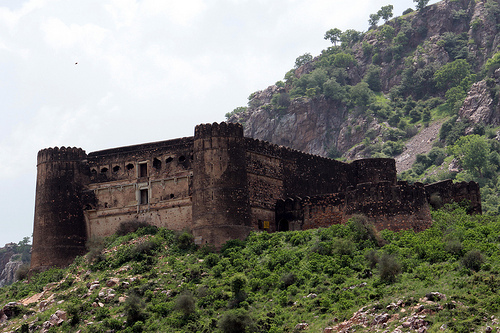 Many people claim to have seen supernatural figures at night during their stay in Bhangarh and some boast of spending a night there without any problem. Reality- no one knows! I had heard of this place before and now, after reading your post I am determined to explore this fort myself. My cousins live in Jaipur and they have told me something similar, that the area should not be visited at night time. I am seriously contemplating doing this. Thanks for sharing the story…I am looking for some reliable content on the history of bhangarh…somehing which can unravel the mystery…btw..nice post..
i haven’t noticed that this palace is so haunted.i believe in all ghost things .i often saw news about bhangarh ka kila’s stories. i want to visit this place as soon as possible to check whether it is true in the time which is restrictd. JUST NOW I CAME TO KNOW ABOUT BHANGARH FORT N REALLY EXITED TO GO OVER THERE IN MY NEXT TRIP TO RAJISTHAN. PL. LET ME KNOW ANY HERITAGE HOTEL NEAR BHANGARH. the locals heard the wolves howling and must’ve related it to the cry of ghosts. MAYBE!! I Am pankaj ray & watching the fear files at zee tv on dated 17/11/2012@10:30pm and see some super natural power’s so i want to visit the place once in my life. 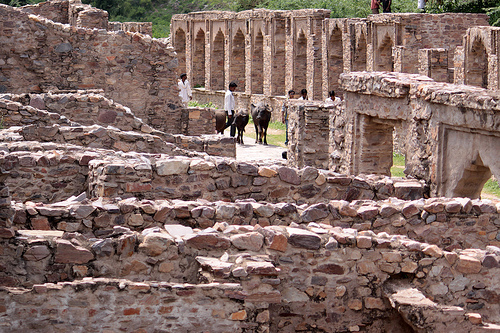 I m really interested and will definately visit Bhangarh.For a day would be good enough to explore all haunted places.